Randi D. Ward is a retired Language Arts teacher from Georgia, USA, who has always been a big dreamer. Her dreams have enabled her to travel to forty-nine countries; influence and inspire thousands of students; and achieve much happiness in her life. In November 2011, she traveled to Cairo, Egypt, to teach young Egyptian adults at an English language center because of a Facebook friend who was creating this new school. This three month experience of living and teaching in Egypt changed her life and attitudes about this often misunderstood region of the world forever, and she knew when she came back home in February 2012, this story and her amazing new insights must be shared with the world. Thus, Because I Believed in Me (My Egyptian Fantasy Came True) hopes to teach, inspire, entertain, and enlighten readers all over the world. Because I Believed in Me (My Egyptian Fantasy Came True) is her first published book; four other books will hopefully be sent to publishers for consideration in 2016: 1) Random Wanderings (a world adventure novel); Dream Bigger (a collection of adult reading level short stories); Fables and Rhymes for All Times (a collection of children’s animal fables and original nursery rhymes); and Reflections and Memories of an Ordinary Woman (a collection of poetry). Writing allows her to motivate, to teach life lessons, and to share her ideas. It gives her another platform from which to be an educator since she is retired from the classroom. She loves to write all kinds—memoirs, novels, adult level and children level short stories, poetry, blogs, essays for magazines, and even song lyrics. Her next challenge will be to write a drama. Randi D. Ward was an admirable citizen of the world; a loving wife, mother, sister, and friend; an Ambassador of Goodwill and Peace who encouraged and taught brotherly/sisterly love to the people of the world through her writing; a dedicated, thirty-seven year veteran classroom educator who always inspired her students to be the best they could be; a woman who dreamed “bigger” and worked “harder” to achieve her life goals. Randi D. Ward is a retired Language Arts teacher from Georgia with 37 years of teaching experience and a published author. Mrs. Ward was named “Entrepreneur of the Year 2014 in the Education Industry” by Worldwide Who’s Who and was profiled in the month of March in the 2015 Worldwide Branding calendar. In 2015 she was honored as this organization’s Distinguished Worldwide Humanitarian of the Year and as a Top Female Executive in 2014 as well an an Inductee, Elite American Artist (2015). Her other awards and credentials include the following: National Association of Professional Women (NAPW) where she was named 2014-15 VIP Woman of the Year, an elite member and 2015 Delegate of the International Women’s Leadership Association (IWLA), a 2014 Pinnacle Professional Member of Continental Who’s Who, an elite VIP member of Strathmore Worldwide Who’s Who where she will be featured on a full page profile in its next book, and 2015 Professional of the Year with International Association of Who’s Who. She appears in a YouTube interview video with President Beth Johnston of IWLA and was featured on the cover of IWLA’s May/June 2016 edition of Inspirational Woman Magazine with one of her articles entitled Taking the Needed Risks. In a October 2016 edition of Women of Distinction Magazine, she was featured in a four page article as an Author/Entrepreneur. On this magazine’s website is a 30 minute podcast interview about Mrs. Ward. In May 2017 she was named Top Professional of the Year by International Association of Top Professionals and received this award at the Awards Gala at the Ritz Carlton Hotel, Battery Park, in New York City, on December 16, 2017. Finally, in 2016 she was selected as Editor of the Year by International Society of Business Leaders, and in July 2017 she became a lifetime member of Marquis Who’s Who. In August 2017 she was named “A Woman of Excellence” by Marquis Who’s Who and then named a Top Professional in September by this same prestigious organization. In February 2018 she was named Top Female Professional by the International Association of Top Professionals. She will appear in T.I.P. (Top Industry Professional) magazine and as an Outstanding Author in POWER magazine (Marquis Who’s Who) in 2018. One of her short stories “Isabella’s Undying Love” was published in the 2018 Valentine Anthology “A Cup of Love” along with 29 other award-winning authors. Profits from this 250-page book will be donated to First Book, an organization that gives free books to children. She taught grades 7 thru 12 in both rural and inner-city schools in the areas of grammar, literature, creative writing, essay writing, research writing, journalism, pubic speaking, and drama. She was a pioneer in the formation of the Gifted Program in West Virginia in the 1970s and helped her alma mater Marshall University in Huntington, WV, create the masters education program courses for the teachers of TAG (Talented and Gifted). She was a member of the Fellows Program for writers for a short time at the university. Mrs. Ward graduated as valedictorian of her high school class and with honors both at her undergraduate and graduate levels at her university. She has been married to her loving husband Bill for over 45 years and has one son Mark who is the art director of the prestigious international magazine Readers Digest in Germany where he lives with his wife Susanne, a freelance illustrator. From November 2011 until February 2012, Randi Ward taught ESOL (English as a Second Language) to young adults at a language center called SYE (Spread Your English) in Cairo, Egypt. She and her two Egyptian partners Ahmed Mohamed and Ehab Mohamed opened an English and German language school called Rise Up in late 2012. Sadly it had to close because of the unstable political situation in Egypt. She was also a former partner and educational instructor and coordinator of 6 October English Institute (formerly called 6 October Nursery) in Egypt with her partner Samar Farouk. Throughout her teaching professional career, Mrs. Ward has motivated thousands of students and has always encouraged them to believe in themselves and to try to do their very best to achieve their dreams. Randi Ward has many varied interests and passions. She is a world traveler and has toured and visited 53 countries in four continents in the last 37 years, including four trips to Egypt. Besides her love for traveling and meeting new people around the world, she enjoys photography, reading in order to learn new ideas every day, personal fitness training, shopping and finding bargains, dancing and music, and chatting online with her almost 5000 Facebook friends and 2600+ followers in 51 countries as well as Skyping with them. She is also active on Twitter, LinkedIn, Google, Pinterest, and several professional groups connected with LinkedIn. Her positive attitude about life has brought her much happiness and the company of many friends. Thus, she wrote her book Because I Believed in Me (My Egyptian Fantasy Came True) to share her adventure and her new insights, to teach, to enlighten, and to inspire readers all around the world. Her book received two great reviews: Clarion Review and Kirkus Review which can be found on her website. In 2014 she pitched her book to twenty Hollywood television and movie producers at Pitchfest Las Vegas. She is currently writing two books of motivational poetry, two separate collections of short stories and nursery rhymes for both children and adult reading levels, and a new novel Random Wanderings, a world adventure. She is also a writer and the Chief Editor for Morocco Pens, an online Moroccan magazine featuring educational articles and essays in English. She dreams of being a professional motivational speaker and having her own radio online podcast to feature talented people around the world and plans to pursue these goals in the near future. As of today, she has created 47 YouTube videos (Her channel name is Randi Ward) to highlight her photographs, her poetry, her former schools in Egypt, her many messages to promote better world communication, some talented friends, and her current humanitarian projects in Africa: (1) World Peace Forest (Africa) in Egypt and (2) Africa Nomads Conservation in Kenya. She is an honorary president and advocate of World Peace Forest (Africa) and the USA Regional Director for Africa Nomads Conservation. This is the link to the video trailer she created for her book https://www.youtube.com/watch?v=Yh_xHVN9SpE. She has also written over 140 inspirational and educational blogs on her book website, created by her publisher Author House for her book: www.randidward.com. 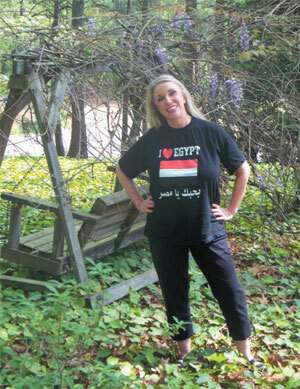 This website also includes links to the eight USA national radio interviews she has done to teach the truth about Egypt after her experiences of living there during part of Egypt’s revolution and of interacting with her many Egyptian friends and students as well as articles written about her in an Egyptian newspaper and a magazine. This is her latest USA radio interview: https://www.youtube.com/watch?v=FxSb8dmXoz4. “Believe! Don’t dream big; dream bigger!